I’ve heard several recent comments on the ‘difficulty’ of making soup entirely from scratch (ie making the broth), but it’s really super easy. Honest, it is. 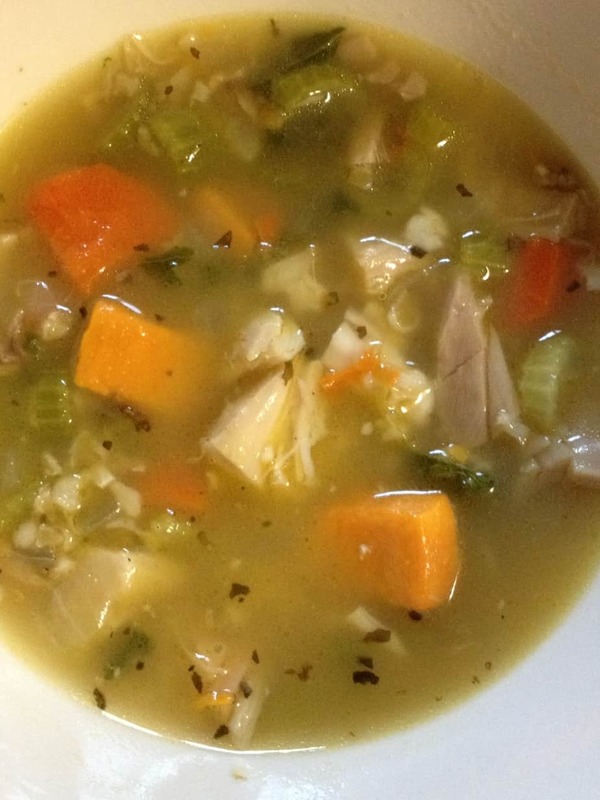 Not only that, making your own chicken stock is way better for you. It is full of minerals and amino acids, which aid in bone and teeth health, immunity, digestion, brain function and a host of other things. It’s also high in collagen, which helps support hair, skin, joints and nails. If all that wasn’t enough, the taste factor skyrockets when a soup is made with homemade stock. Maybe you will be after I tell you how I make my homemade stock the super easy way. Just a few extra steps are required to make your own instead of opening a can or box of prepared broth. And all the steps are easy. You basically just need a couple pounds of bones (the bones from two chickens or a turkey), some water, a few veggies and a crock-pot. Since I’m fortunate enough to live near a store that sells healthy, free-range roasted chickens, I just buy a couple of already roasted ones and cut the meat off the bones. I don’t pick them clean, but I do take the majority of the meat and skin off the bones. If you don’t have access to a healthy source of already roasted chicken, you can roast your own and retain the bones to use. An important note is: use bones from healthily raised animals as boiling them draws out whatever is inside. You want good stuff, not bad stuff. Next, I throw the 2 carcasses in the crock-pot with an onion, a couple carrots, a couple pieces of celery and some garlic. No need to peel or even chop up the vegetables. I usually snap the washed carrots and celery in half and call it good. Then, I add enough water to cover the bones. Put the lid on, and let it cook all day. The longer, the better (10 or 12 hours). And mmmm. It smells so good. When I’m ready to seperate the bones from the broth, I place a strainer in a large bowl, dump the contents of the crock-pot into the strainer, and allow the bowl to catch all the broth. I throw the bones in the trash and the veggies in the compost. They’ve served their purpose. Now, the broth is ready to use for soups or anything else you’d like to make that calls for broth or stock. Or, you can freeze or can it and use it later. I most often use mine fresh, though, as my mouth is watering from smelling the stock simmering all day long. I can barely wait to make it into soup and eat it. See, easy, right? 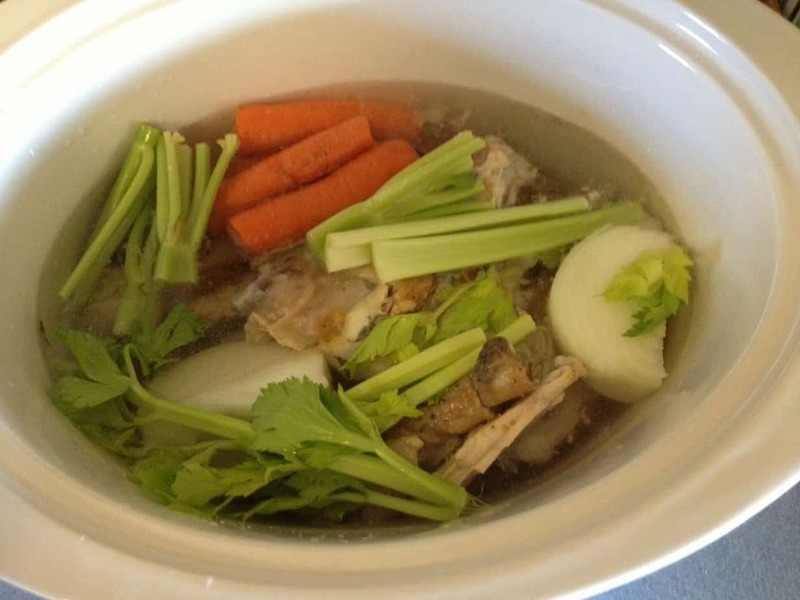 If you’ve never made your own chicken stock, try it. With a crock pot the job is super easy and the taste (and health benefits) are out of this world. Do you have any helpful stock tips? Let us know!